The cost of frying food products for small-scale industry bake shop is now becoming expensive brought about by the ever-increasing cost of LPG fuel. 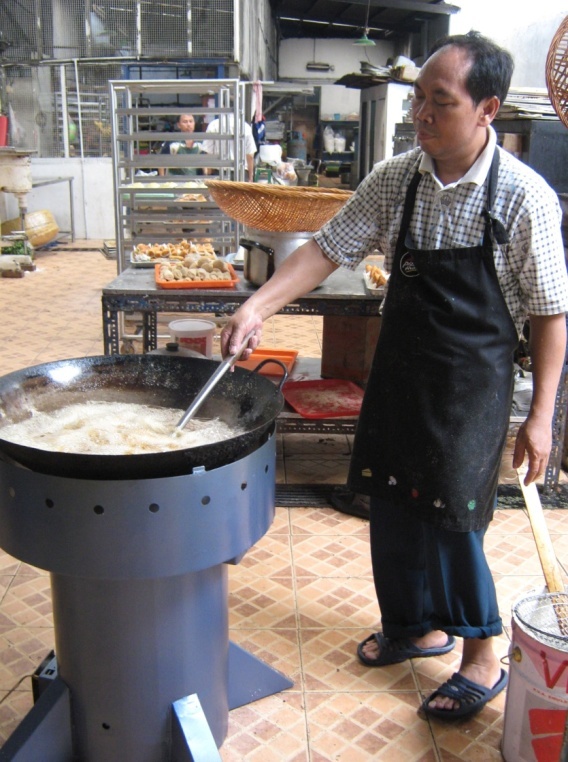 Based on the experience of Sakura Ampan Bakeshop in Jakarta Pusat, Indonesia, a single-burner gas stove consumes about 2.2 kilogram of LPG per hour. With the present cost of LPG of IDR 350,000.00 per 50-kg tank, the bakeshop is spending around IDR 15,400.00 per hour for cooking and/or frying food products. For 8 hours operation per day, around IDR 123,200.00 is spent for its cooking/frying activities using LPG. Coal, which is abundant in supply and so far the cheapest of the fuels available in Indonesia, is the only alternative fuel to LPG that is considered economical and feasible for small-scale industry use. However, the emission of sulfur dioxide (SO2), which is the predominant reason for the unacceptability of this fuel among households, makes the use of coal unpopular for industry application. Nevertheless, this problem is now resolved by gasification. 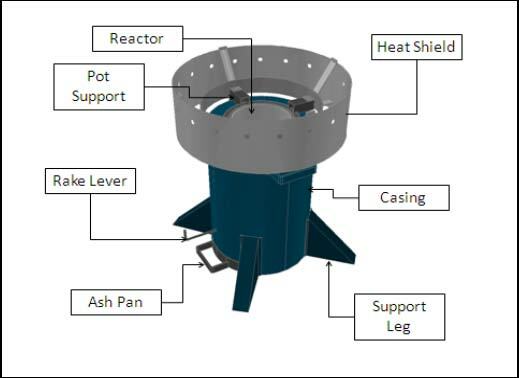 Injecting lesser amount of air to the coal bed during gasification in the stove greatly reduced the amount of SO2 emission as compared with the conventional direct combustion burning of fuel. By gasification, coal can be conveniently used with almost no SO2 emission during cooking. In the month of September 2008, the PTMJ Approtech in Jakarta Selatan has designed and developed a top-lit-updraft (TLUD) gasifier stove for Sakura Ampan Bakeshop using raw coal as fuel. This project was carried out as part of the research and development program of MJ Approtech on biomass energy that is geared toward the production of appropriate technologies for thermal application, particularly for small-scale industry sector. The stove was tested in terms of water boiling and kitchen performance tests. The water boiling test was done at the PTMJ Approtech R&D Unit at Taman Tekno, BSD City, Serpong, Tangerang, Banten, Indonesia. The performance of the stove was evaluated by measuring the following parameters: fuel consumption rate, thermal efficiency, power output, and others. Kitchen performance tests were carried out at the Sakura Ampan Bakeshop in their actual frying of food products. The food products, specifically egg rolls, were fried in the stove in batches. Comparison of the quality of food products fried in the coal gas stove and those fried in their existing industrial LPG stoves was done by the Chef of Sakura Ampan Bakeshop. Results showed that the coal gas stove operates at an average of 2.97 kg of raw coal per hour. One full-load of fuel in the stove requires 8 to 9 kg of coal fuel. It was observed further that the fuel is ignited using few pieces of wood charcoal or chunk wood plus drops of kerosene and produce spontaneous combustion within 3 to 5 minutes thereafter. Fifteen liters of water is boiled in the stove within 30 minutes from the start of firing. The computed power output of the stove is 3.8 kW with specific gasification rate of 85 kg/hr-m2. The thermal efficiency was computed based on the data obtained at 27%. The temperature of the flame was measured from the bottom of the pot and ranges 500 to 750°C. 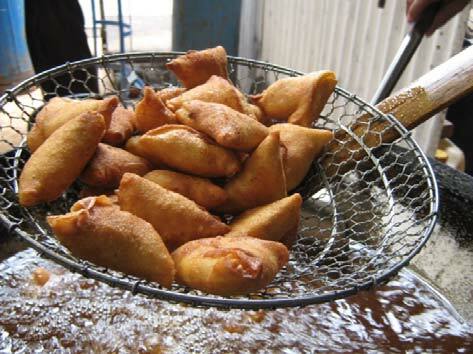 Actual frying test at the bakeshop revealed that 35 pieces of egg rolls can be cooked in the stove in 3 to 5 minutes at an oil temperature of 140°C. 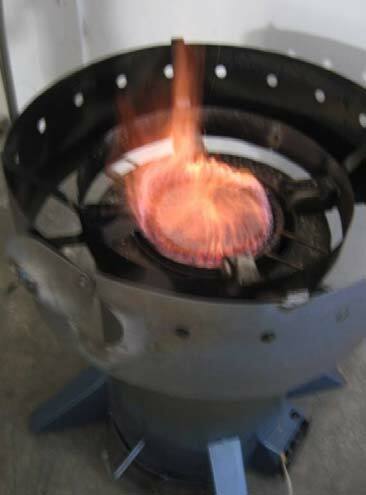 Gasifying raw coal in the stove was observed to produce smokeless burning and almost no odor of sulfur dioxide during operation. The presence of fly ash was observed to be negligible. More importantly, the Chef of the bakeshop confirmed that the quality of fried products is the same with that of the LPG stove. The total cost in fabricating a unit of the coal gas stove is IDR 5,000,000.00. At IDR 1,200.00 per kg of raw coal, the cost of fuel in operating the stove is IDR 3,564.00 per hour. A saving of IDR 11,836.00 per hour can be derived in using the coal gas stove over LPG stove, or a total of IDR 94,688.00 per 8-hour/day operation. In this case, the owner of the bakeshop can recover his investment for the stove within 3 months of use (at 20 days per month utilization). For further information, please contact Mr. Djoewito Atmowidjojo, President Director, PT. Minang Jordanindo Approtech, Jakarta Selatan, Indonesia (mjapprotech@yahoo.com) website: http://www.minangjordanindo.com. MJ Approtech would like to acknowledge Pak Mario of Sakura Ampan Bakeshop for trusting us this project.